Sturge-Weber syndrome is a disease that affects the skin and nervous system (neurocutaneous) and is associated with Port Wine Stain, red vascular markings on the face and other parts of the body (shown here on the legs). This is an unusual case, due to the large size of the lesion (extensive involvement). 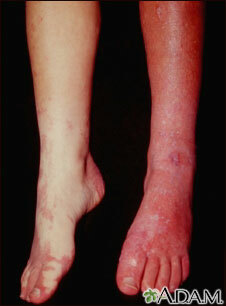 Occasionally seizures or learning disorders are also associated with Sturge-Weber syndrome.